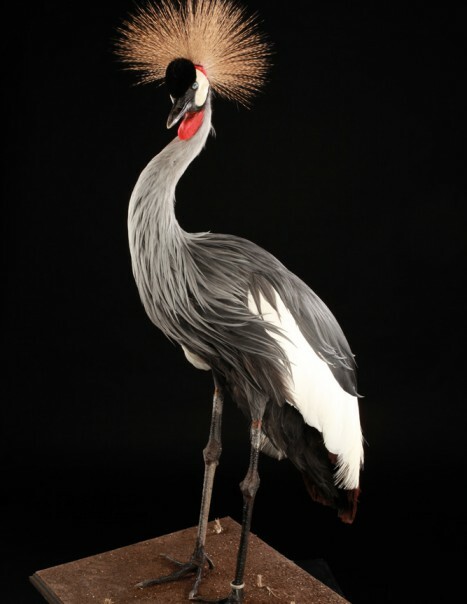 The Black Crowned Crane is considered to be the messenger of peace in the Kenyan culture. 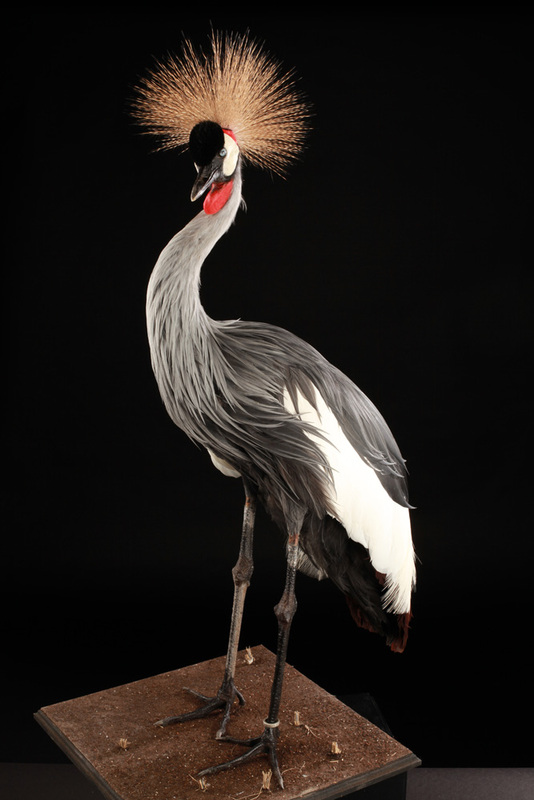 This species is often confused with the Grey Crowned Crane – Balearica regulorum – that it is very similar in appearance, but their geographical distribution is different. 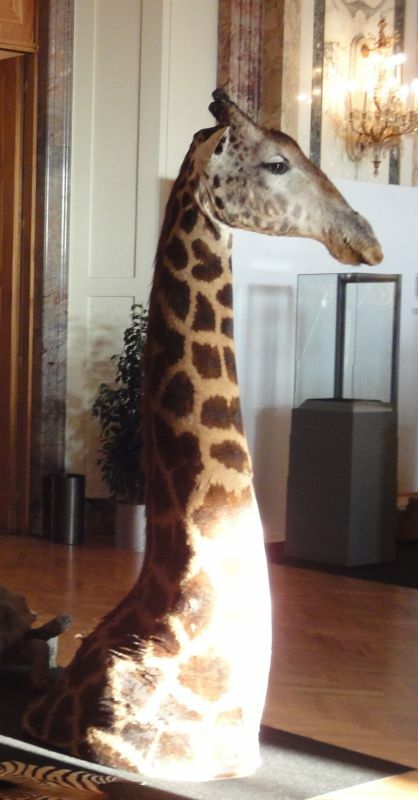 The adult body and neck are mainly dark gray or black. The wings have white covers, both above and below. Primary feathers are black, while the secondary and tertiary are bright chestnut. You can see a yellow spot on the major inner covers, formed by long thin feathers also visible. The head, forehead and the front of the cap are black. The back of the cap wears a beautiful pale gold crest, made of stiff feathers and fine arranged in a ring. The long straight beak is grayish black. The eyes are light blue. Long legs and feet are greyish black. Both sexes are similar and Juvenile is greyish brown with brown crown and nape. These cranes cry while flying and during courtship. They emit soft cooing with chicks. It frequents grassy and moist mixed habitats with shallow water in flood plains, rice fields, wet crops and upland fields in West Africa, large marshes and wet meadows, lakes, rivers and ponds. It nests and feeds into the highest fields, but near wetlands. It eats insects, invertebrates, molluscs, crustaceans, fish, amphibians, reptiles, plant materials such as seeds of several species of plants, wild and / or cultivated. It pecks and rarely digs with its beak. Before mating, one of the two birds emits a low cry while lifting the wings with slightly arched body forward. The couplings are repeated for several weeks before laying. During the nesting, both parents defend the territory and drove off site all intruders that arise. The breeding season is between July and October, according to the rainy season. Both sexes build a circular platform with grasses and sedges, often placed along the boundaries or within the wetlands with dense vegetation. The female lays 2-3 eggs. Both parents incubate for about 28-31 days, the female especially at night, and then they incubate each in turn throughout the day. The chicks are precocial and follow their parents soon after hatching. They are feathered between 60 and 100 days after birth. Crowned Crane is sedentary and make only a few daily or seasonal movements, especially between dormitories and feeding areas.They sleep together outside the breeding season, often in large trees such as baobabs. The Crowned crane flies with the head, neck and legs stretched. It must run to soar. It earns faster speed upwind and flies with a thrust of his broad wings. It lands with wings and legs dangling, and lands upright after a last flutter of wings. Its flight is powerful and it also uses thermals to soar. The species is protected by law in most of its distribution, but is considered as vulnerable.